This topic describes how to add partial-page update support to a Web page by using two Microsoft Ajax server controls: the ScriptManager control and the UpdatePanel control. These controls remove the requirement to refresh the whole page with each postback, which improves the user experience. For more background on partial-page updates, see Partial-Page Rendering Overview. An AJAX-enabled ASP.NET Web site. Create a new page and switch to Design view. 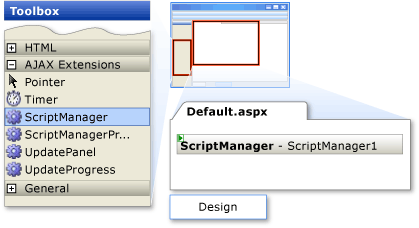 In the AJAX Extensions tab of the toolbox, double-click the ScriptManager control to add it to the page. Double-click the UpdatePanel control to add it to the page. Click inside the UpdatePanel control and then in the Standard tab of the toolbox, double-click the Label and Button controls to add them to the UpdatePanel control. Make sure that you add the Label and Button controls inside the UpdatePanel control. 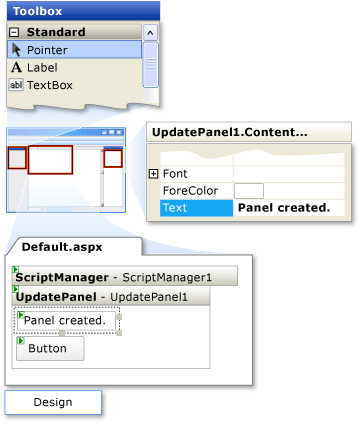 Set the Text property of the Label to Panel created. Double-click the Button control to add a handler for the button's Click event. Add the following code to the Click handler, which sets the value of the label in the panel to the current time. Save your changes and press CTRL+F5 to view the page in a browser. Notice that the text in the panel changes to display the last time the panel's content was refreshed. This text is set in the button's Click event handler. The example is styled to better show the region of the page that the UpdatePanel represents. The panel content changes every time that you click the button, but the whole page is not refreshed. By default, the ChildrenAsTriggers property of an UpdatePanel control is true. When this property is set to true, controls inside the panel participate in partial-page updates when any control in the panel causes a postback. You can understand the benefits of the UpdatePanel control best by adding some controls to the page that are not included in the update panel. You can then see how their behavior differs from the controls inside the update panel. Create a new page and switch to in Design view. 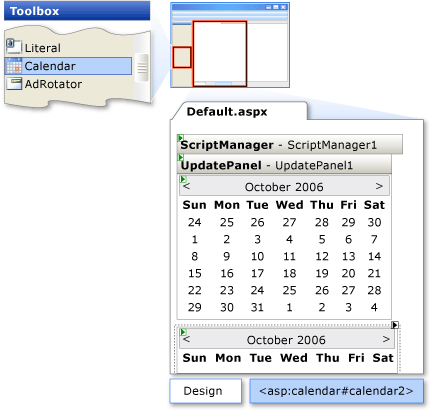 Click inside the UpdatePanel control and then in the Standard tab of the toolbox, double-click a Calendar control to add it to the UpdatePanel control. Make sure that you add the Calendar control inside the UpdatePanel control. Click outside the UpdatePanel control and then add a second Calendar control to the page. This control will not be part of the UpdatePanel control. Save your changes and then press CTRL+F5 view the page in a browser. Navigate to the previous or next month in the calendar that is inside the UpdatePanel control. The displayed month changes without refreshing the whole page. The whole page is refreshed. By default, a postback control (such as a button) inside an UpdatePanel control causes a partial-page update. By default, a button or other control outside an UpdatePanel control causes the whole page to be refreshed, as you have seen. You can also configure a control outside the update panel to be a trigger that refreshes just the update panel. 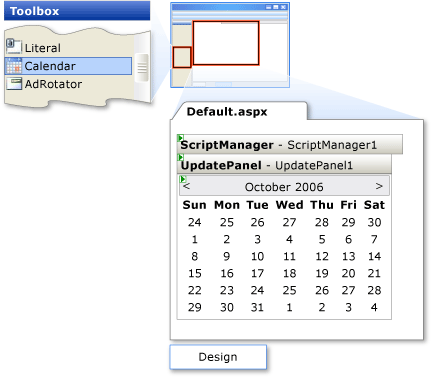 In the AJAX Extensions tab of the toolbox, double-click the ScriptManager and UpdatePanel controls to add one of each control to the page. Click inside the UpdatePanel control, and then in the Standard tab of the toolbox, double-click the Label control to add it to the UpdatePanel control. Click outside the UpdatePanel control and then add a Button control. Switch to Design view, select the UpdatePanel, and then view the Properties window. If the Properties window is not displayed, press F4. In the Triggers field, double-click the ellipsis (…) button. 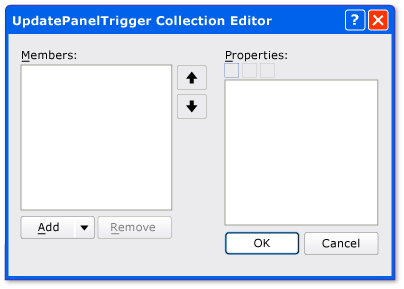 The UpdatePanelTrigger Collection Editor dialog box is displayed. Click Add to add a new trigger. In the ControlID field of the trigger properties, use the drop-down list to select Button1. 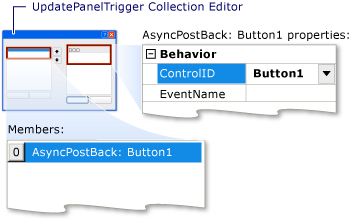 In this example, the EventName property of the trigger was not specified. Therefore, the button's default event (the Click event) will trigger the refresh of the UpdatePanel control. Click OK in collection editor. The text in the panel changes to display the time that the panel's content was refreshed. Click the button several more times. The time changes, but the whole page is not refreshed. Clicking the button outside the UpdatePanel refreshes the panel's content because you configured the button to be a trigger for the UpdatePanel control. A button that is a trigger performs an asynchronous postback when you click it, and causes a refresh of the associated update panel. 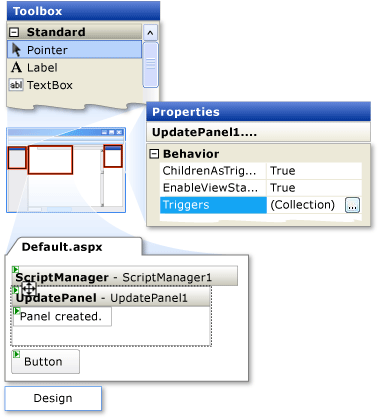 This behavior resembles the behavior of the first example in this tutorial, where the button was inside the UpdatePanel. The example is styled to better show the region of the page the UpdatePanel represents. 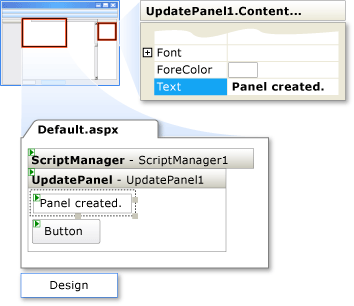 This tutorial introduced the basic concepts of using an UpdatePanel control to enable partial-page updates. 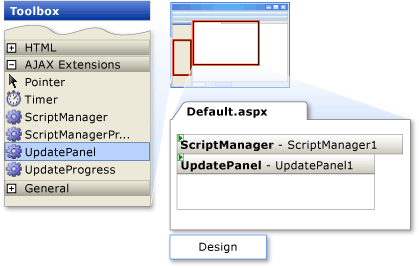 You must always add a ScriptManager control, and then add an UpdatePanel control. By default, controls inside the panel will cause the panel to refresh when they perform a postback. External controls can cause an UpdatePanel to be refreshed if they are configured as a trigger for the panel. The next step is to learn about how to add multiple UpdatePanel controls to the page. 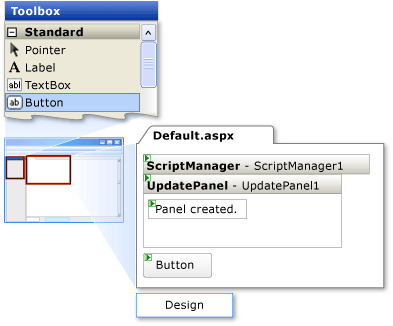 For more information, see Creating a Simple ASP.NET Page with Multiple UpdatePanel Controls.